Rely on Old Republic Home Warrany! 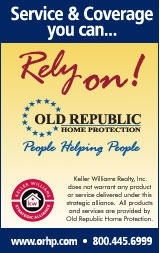 An Old Republic Home Warranty Plan Provides many excellent benefits for all parties in a Real Estate Transaction! Sell Faster - by providing a competitive edge over other homes on the market. Sell For A Higher Price - because when a buyer feels protected from unknown after-sale problems, it can discourage downward price negotiations. Sell With Peace Of Mind - knowing that after you have moved out, covered service items will be taken care of- offering you additional after-sale liability protection. Your Real Estate Agent can help you select your plan.